With more than 70 years of operation and thousands of live sports books, the Irish sports bet giant has an infrastructure that dwarfs even the largest online poker destination. 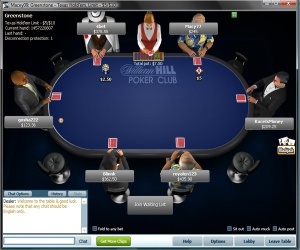 In recent times, William Hill has teamed up with the iPoker Network, the largest poker network in the world, to create William Hill Poker. So when you couple the experience of William Hill and the unrivalled support of iPoker Network, you get a very secure, stable and credible poker room. 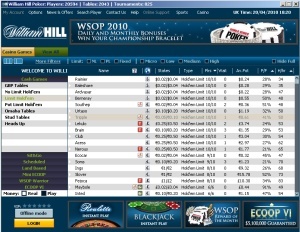 With so many players online at Will Hill, finding the easy games and the fish is always easy. If you are looking for a long term room, especially for the cash games. This could be your new room. Why not take advantage of the free All Aussie Poker up to $2000 bonus and start playing at William Hill today. Payment Methods VISA, MasterCard, Neteller, ClickandBuy, Skrill (formerly Moneybookers), Click2Pay, Paysafe card, ukash, Bank transfer, POLI, Maestro, Laser, Dankort, PayPal, iDEAL, Western Union, Przelewy24, eNets, Nordea, WebMoney, UseMyBank, EntroPay, wire transfer and bank draft, plus some local payment options. Options VISA, Neteller, Diners Club, MasterCard, Maestro, Electron, Solo, Laser, ClickandBuy, Skrill (formerly Moneybookers), Click2Pay, EntroPay, wire transfer, bank draft and personal check.